On my recent trip to the United States, I stopped by Williams Sonoma and purchased a kitchen gadget called the Smoking Gun that I had been looking forward to trying. 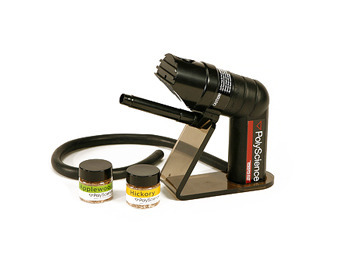 Made by PolyScience, the company behind much of the kitchen equipment used in molecular gastronomy, the Smoking Gun is an easy way to smoke food at home, without the need for a barbecue or smoker. A few weeks ago, I had the opportunity to put it to the test at my friend Nat’s house, where he, Chow, and I prepared a four course meal. Each course contained a smoked element. This video shares the whole story but photos are below, too. The Smoking Gun is more or less a battery powered hair dryer with a smoking chamber. You put the combustable substance in the chamber, turn on the fan, and then light the substance. Air is drawn through the smoking chamber and the smoke it blown out a spout to which a rubber tube can be attached. This makes it easy to direct the smoke where you want it. The Smoking Gun is easy to use and about thirty seconds is enough to produce as much smoke as you need. The smoke can come from wood chips (four types are sold directly by PolyScience), herbs, spices, tobacco, etc. and can be used on meats, dairy products, fruits, vegetables, and beverages. The key is that you need to trap the smoke in the cooking vessel or some other container and allows the food to absorb the smoke compounds for at least five minutes. 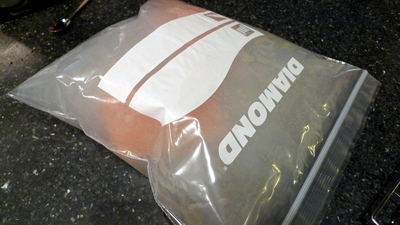 Here, some pieces of sushi-grade salmon are smoked in a zipper-lock plastic bag. The meal started with sashimi grade salmon which had been smoked (I used a different type of wood with each dish but don’t remember which I used) and then served very simply with creme fraiche and a chiffonade of shiso leaves. 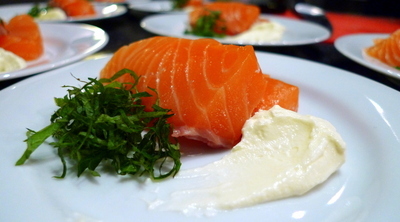 The lemony flavor of the herb and the tanginess of the creme went nicely with the salmon. Unfortunately, I don’t feel like the salmon was as good quality as I wanted and it warmed up a bit too much during plating. Other than that, it was tasty. The second course was cod fish. This, too, was smoked and then pan-fried in an oil that had been infused with Thai “tom yam” herbs. The fish was accompanied by a garnish of the fried tom yam herbs including shallots, garlic, lemongrass, and chilies. The smoke flavor was less noticeable on this dish. If I was to do it again, I would fry a second batch of herbs to serve as a garnish, instead of using the herbs that had infused the oil with flavor. The third course was beef tenderloin, smoked and then cooked sous vide. Afterwards, the beef was briefly pan seared and served with a broiled butter leaf lettuce, roasted, carrots, and air fried potatoes. Again, the smokiness was pretty subtle but the beef was nicely tender. The broiled lettuce was a real treat, lending a lot of complexity to an otherwise simple vegetable. For dessert, I fired up the butane torch and burned some sugar. Where there’s smoke, there must also be fire, right? 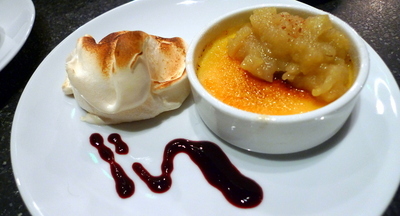 Vanilla creme brûlée with meringue, smoked Granny Smith apple compote, and raspberry coulis. The smoked apple compote was very successful – I used both wood chips and cinnamon in the Smoking Gun – and the meringue was a nice touch. I must admit to being proud of thinking of a way to use the leftover egg whites and browning the meringues with the torch made them very attractive. My overall impression of the Smoking Gun? It is an easy to use tool and effective for adding a subtle, superficial smokiness to food. It isn’t the same as smoking pork belly for twelve hours to get bacon, but it also requires a lot less space, so the trade-off is worth it. I’ll have to think carefully about what items to smoke and would like to experiment with using herbs and spices. Hopefully, that means more videos! This entry was posted in Uncategorized and tagged cooking, food, gastronomy, gun, kitchen, molecular, polyscience, smoke, smoking, smokinggun by christao408. Bookmark the permalink. impressive. Use that gun on a rotisserie chicken then you’ll have the NOPA chicken LOL. I have not heard of the gun. It looks intersting and a good addition to a kitchen. Yummy. I am impressed. I built a small brick oven in the back yard just outside the kitchen door. Sure it isn’t nearly as convenient as the smoking gun, but I like building the fire inside it and the process of preparing food in a more ancestrial manner If we had a working fireplace I would use it insteaed.I am going to have to try broiled lettuce. I will brush on a little olive oil first and perhaps crushed Himalayan pink salt. This looked delicious and a lot of fun to make – I can imaging there are subtle differences depending on the type “combustible” you use. My husband loves kitchen toys but I’m not going to ask for this one… he doesn’t need to be playing with smoke!! I like this smoking gun and the food looks totally yummy. I think I would use it in the picnic area in our apt complex to not have the smoke smell in the apt if that makes sense.How is the smoke smell that leaks out of the pan and is it subtle?TY for reccing this. If you put the smoked salmon in a baggie and place it in the refrigerator for two minutes you can later add more smoke to the baggie. Repeat for three times to get a stronger smoke flavor. @PPhilip – That’s actually what I did. @aPieceOfTheSky – Oh, no need to be envious. I just play around and usually don’t quite know what I’m doing! @Grannys_Place – If you didn’t have good ventilation in your kitchen, the smoke smell would linger. I found that turning on the vent hood and opening a window was enough to keep it under control, though. @iskrak – Haven’t heard of the konro grill – will have to investigate. 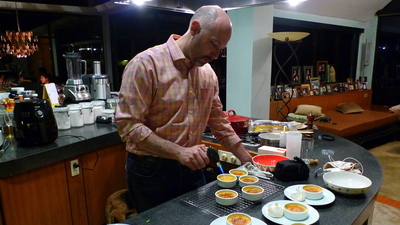 The cod dish has a lot of potential but we didn’t realize it effectively. Will have to keep revising it. @murisopsis – Awww… no fun for him, then! @Aloysius_son – On my list of things to have in a dream house is a brick or clay oven. Would like to bake bread for the whole village! @CurryPuffy – Smoking Gun was my only toy bought on this trip. About US$ 100. @Fatcat723 – What every cook needs… well, not really…@LostSock21 – Am not sure that it would really impart that much additional flavor. The longer a food is cooked, the less the smoked flavor will remain, I think. @KevEats – Yeah, it is a neat toy. @christao408 – The brick oven was very easy to do, once I rounded up the materials. There are a gazillion plans online. You could build it in a day with very little effort. I got my firebrick from a construction site where they were demolishing an old smoke stack and throwing away the bricks. My only cost was time and mortar. Those dishes look delicious (as per usual). What type of Cod is that? I’ve recently been introduced to black cod (Sablefish) and it’s fantastic (when I can find it here). that looks like a great test kitchen to work in. never worked with a smoke gun or device before. should be interesting to make a ‘smoke’ flavor for ice cream/sorbet. is that even possible, you think? I have to wonder if smoke ingredients are safe. sometimes when i have a lot of meat, fish etc that I have cooked, i put it on a large platter, and clear a place in the center to place a small steel bowl with aromatic dried herbs or sandlewood or hickory chips, and set them on fire. I close the platter with a lid and let the smoke permeate the meats. I have never seen a smoke gun before. @Aloysius_son – All I need now is some land. Don’t think the condo association will let me build a brick oven on the balcony! =D@ZSA_MD – Oh, you take all the fun out of my new toy! =( Just kidding of course. Yes, there are plenty of other ways to impart a smokey flavor without buying the smoking gun. The one thing I particularly liked about it was the ability to better direct where the smoke goes. I think doing as you described might require even more ventilation. @Inciteful – There’s a big label on the box as required by California law, warning that smoke contains carcinogens. Tell that to the eaters of barbecue and grilled meats for thousands of years. I figure the amount ingested is small. @rudyhou – Smoked ice cream (or whipped cream) is definitely possible and one of these times when am at Nat’s (who has an ice cream maker and large freezer) I will try it. A smoke and bourbon vanilla flavor would be nice as would smoke and cherries. @paperblanks – You know, I don’t remember what we ended up buying. Fish here is sometimes named in funny, inconsistent ways. I am still getting a home cooked meal when I visit, right? @Wangium – The only question is, when are you visiting? I’ll have to bring you a flame thrower when I visit.